Cook is pleased to provide you with this clinical update on the Zenith® Fenestrated AAA Endovascular Graft, which was commercially approved by FDA on April 4, 2012. 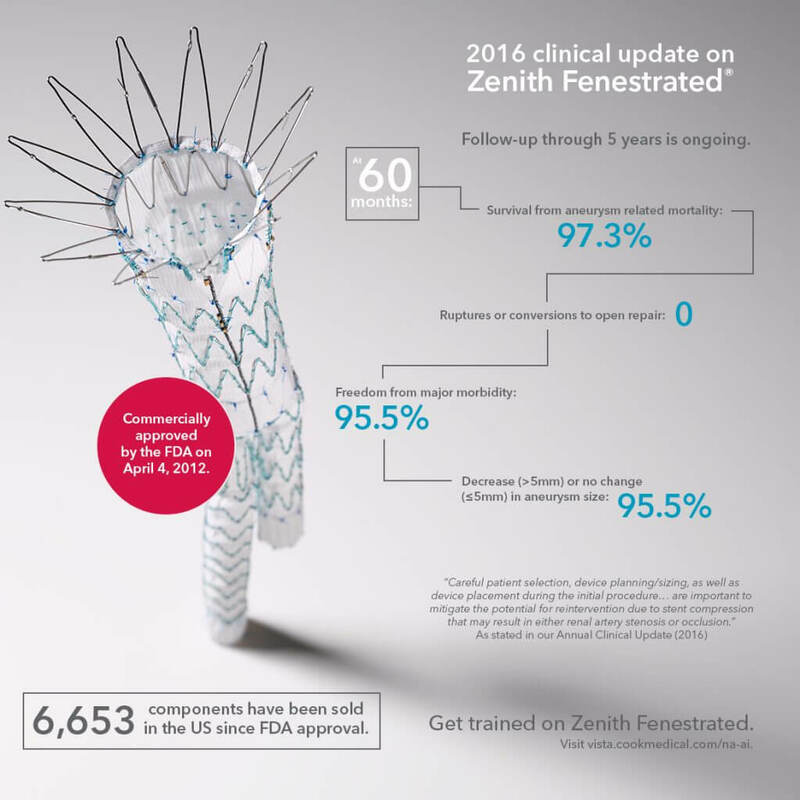 Section I provides an update on results from the long-term post-approval study for the Zenith® Fenestrated AAA Endovascular Graft as of March 02, 2016. The long-term study consists of 88 patients total, including the patients enrolled premarket (67 patients) and patients enrolled postmarket (21) with enrollment now complete. Follow-up through 5 years is ongoing. Survival from aneurysm-related mortality at 60 months is 97.3% thus far. To date, no death was found to be related to failure of a component of the device. There have been no ruptures or conversions to open surgical repair. Freedom from major morbidity at 60 months is 95.5% thus far. There have been no patients with Type I or Type III endoleak based on core laboratory analysis. There have been 4 reports of an increase in aneurysm size, all in conjunction with a Type II endoleak. There were 2 reports of migration, both in patients with evidence of disease progression at follow-up (without aneurysm pressurization); one patient had associated fenestration stent compression requiring secondary intervention. Three patients were noted to have fracture of a fenestrated stent. The first patient was noted to have fracture of a fenestration stent and the seal stent on the Zenith® Fenestrated AAA Endovascular Graft, neither of which resulted in endoleak, a clinical renal event, or the need for secondary intervention. This patient also exhibited disease progression at follow-up in the absence of aneurysm pressurization. The second patient with a fenestration stent fracture also did not have endoleak, a clinical renal event, or the need for secondary intervention. The third patient with fenestration stent fracture was found to also have renal artery occlusion, but has not required reintervention. The majority of patients who underwent reintervention following treatment with the Zenith® Fenestrated Graft AAA Endovascular Graft (11 of 21) did so for renal artery or device stenosis. 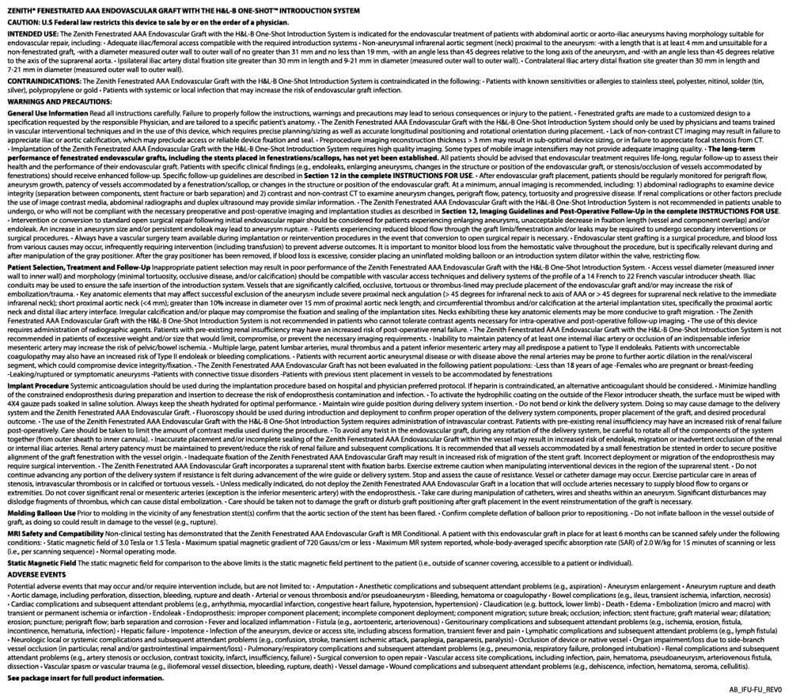 Section II summarizes commercial experience. A total of 6,653 components have been sold in the US since April 4, 2012. A total of 2,265 components have been sold in the same time outside the US (OUS) – note: there are minor differences between Fenestrated devices available in the US and OUS (e.g., difference in graft diameter, number and location of stents relative to the graft material). There have been 90 procedural and follow-up complaints reported during this time. Section III summarizes the findings from explant analysis. To date, one explant has undergone analysis. Section IV is reserved for any new notes or general instructions to clinicians, of which there are none at this time beyond those already covered as part of the indications, warnings, and precautions from the Instruction for Use (IFU). Section V provides a brief summary of the indications, warnings, and precautions from the IFU. Read the full clinical update.